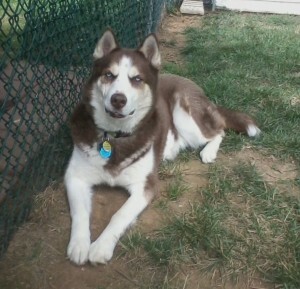 Innoko is a beautiful red and white boy that was left to fend for himself in his yard. You can see in the “before” photo how his hair was burnt from the sun. His fur has now turned a very dark and beautiful cinnamon color now that all the dead burnt hair is gone. Innoko came into rescue severely heartworm positive and is on medical hold while he goes through his treatment. He has gained 22 pounds since coming into rescue and he is a little on the chubby side. Now to lose a couple of those pounds… During his treatment Innoko has not really been with other dogs. He will be dog-tested at a later date to see how he does. Please look for updates on this handsome boy! **Update Sept 19-2014 – The one time skinny little boy now weights 79 lbs. He was at the vet today for another HW test and has since gained 33lbs. He is now HW Negative!